The Galaxy S5 is set to launch on April 11th, but eBay's ready to throw a bone out to the more impatient among us. 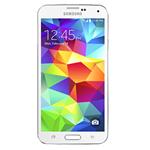 As a part of today's Daily Deals, the site is offering an unlocked Galaxy S5 for $699.99. That's nothing to sneeze at by any means, but it's more affordable than the same phone at Negri Electronics, where it's going for $720.50, or Newegg, where it's listed at a whopping $799.99. Unlocked Galaxy S5 Pops Up On eBay Daily Deals Early For $699.99, Supposedly Ships Within A Day was written by the awesome team at Android Police.